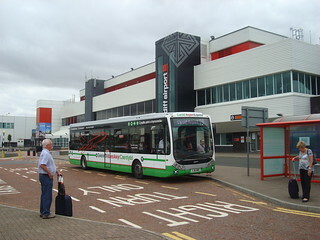 Topics relating to the Welsh Government funded long-distance bus network for Wales. We Wish You A Merry Christmas… There hasn’t been much to be merry about recently, so to avoid another rant I’ll put out a mini travel report with a happy ending. Twenty days ago (5th December 2016), I left work in a hurry. I had just realised what the time was; I normally leave a few minutes sooner if I’m aiming for the bus I was intending to catch that evening. 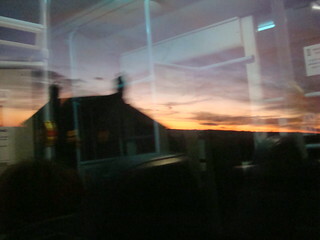 Thanks to quite a bit of running, and the bus being slightly late, I caught it. Later in my journey, while changing bus, I got out my mobile in order to phone home and arrange my lift from the bus stop. It wouldn’t turn on; it would light up and make the right (horrible) start-up noises, but then the screen would be blank. On about the third attempt I noticed that, just before it went blank, it would say ‘recharge battery’ or something to that effect. Oh blast, I thought; either I had forgotten to turn the thing off last time I used it or it had turned itself on without me realising (it has a habit of doing that, if I lean on something in the wrong place the power button can be ‘pressed’, for this reason I try to remember to leave it at home if going to the theatre/cinema). Given the time of year, it would be too dark to walk home from the bus stop (had this happened in the summer, I’d probably have walked). Fortunately, I had recently replaced the battery on my laptop with one that works, so it had some charge. That, in theory, would give me the means to send an e-mail in the hope of arranging my pickup; but would I be able to connect to the internet? My next bus was a TrawsCymru T5 service; TrawsCymru services are supposed to have WiFi, I could be in luck. But would the vehicle be one of the TrawsCymru fleet, or a stand-in due to a failure? Even if the booked bus arrived, would the WiFi be working? Thankfully, the bus that turned up was one of the WiFi equipped TrawsCymru branded ones. Once seated, I nervously tried to connect; and BINGO it worked. I managed to get a message through and somebody was there to collect me, all thanks to TrawsCymru’s WiFi. There’s the happy ending. If you want to leave it on a happy note, don’t read the following paragraph. Now what if my laptop battery had been flat too? Some of the TrawsCymru vehicles have power sockets, but most don’t and even the ones that do have very few (and I don’t think they work, although it’s years since I last tried one). Now snappable on Sundays? I took this photo on a weekday last year, but it should now be possible to take similar on Sundays. There’s some good news today (29th May 2016). 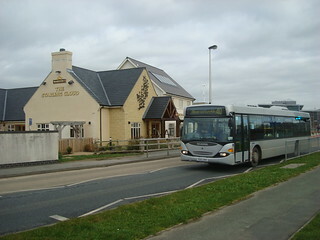 Today is a Sunday, and for the first time in many years Cardigan will be served by a mainline bus service (in recent years, the only Sunday buses in Cardigan have been the coastal path walkers’ buses, which only run on Sundays in the summer). However, there still won’t be any bus services in Cardigan on Sundays during the winter, since today’s new Sunday services are only operating from the last Sunday in May to the last in September. The new Sunday timetable will also run on bank-holiday Mondays, again until September. So, what is Cardigan’s new summer Sunday service like? The answer is that there are three journeys to Haverfordwest and back, three to Aberystwyth and back and two shorter workings, one to/from Newport and the other to/from Fishguard. Two trips in each direction appear to be through services between Aberystwyth and Haverfordwest (whether or not they actually require a change of bus in Cardigan, as I believe is often the case with the Mon-Sat T5, I’m not sure). As you would probably expect, these services are advertised under the TrawsCymru T5 banner, but unlike the rest of the week the Sunday T5 appears to operate a fixed route, with all the Aberystwyth workings travelling via both New Quay and Aberporth. Really then, north of Cardigan this is the old TrawsCambria 550 in disguise. Confusingly, with the services to Haverfordwest the timetable doesn’t indicate whether Trecwn and Mathry Road are served. A year ago, I commented on the introduction of the TrawsCymru T5 service. I was very critical of the service, and promised further posts detailing the problems. However, it’s the service’s first birthday today, and I still haven’t done so. I’m not promising I’ll ever get round to completing the lot, but here’s the first part of that detailed coverage. ‘What are service numbers for?’ That’s a question raised by the T5 (and several local services in the area, but that’s another blog post, again if ever I get round to it). This particular problem is that the ‘T5’ is a blanket designation of a number of routes. 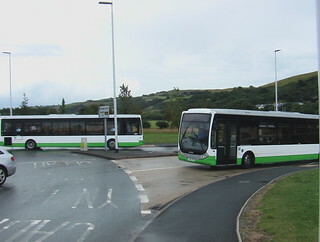 In my travels between Cardigan and Aberystwyth before the introduction of the ‘T5’, I witnessed at least three cases of passengers being confused as to where buses would take them. At least two of these were in 2014, when the ‘X50’ timetable between Cardigan-Aberystwyth was much the same as today’s ‘T5’. One of these was evidenced by some passengers, who obviously expected to travel to somewhere on the detour via Aberporth, jumping up from their seats in surprise as we passed the roundabout which leads to Aberporth without turning off. I seem to remember the driver let them off next to the roundabout, but they’d have had a long walk to Aberporth. 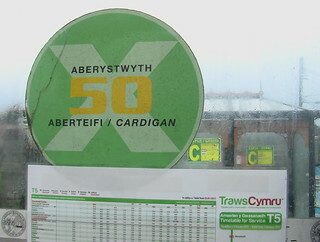 Like the ‘T5’, 2014’s incarnation of the ‘X50’ was a blanket designation, covering all Cardigan-Aberystwyth services. I’ve not been travelling to/from Aberystwyth regularly since before the ‘T5’ started, so I’ve not had the chance to observe further confusion. In the more-distant past, things made more sense as there was a ‘550’ service via New Quay and Aberporth and the ‘X50’ was generally direct. However, it wasn’t perfect, some trips served only one of the two (ie. New Quay or Aberporth) and they didn’t have a special service number for those. The third of my observations was such a case, passengers for Aberporth had let an ‘X50’ which went via Aberporth but not New Quay go without them, assuming it didn’t travel via Aberporth. They would have had a wait of well over an hour for the next ‘550’. Of course you have to draw the line somewhere, giving the very occasional detours to Aberaeron school a separate route number would only muddy the waters (the school is under 500 metres from the main Alban Square bus stop in Aberaeron), but I believe detours as major as Aberporth and New Quay need to be clearly identified. Returning to the present, the days of services via Aberporth but not New Quay are gone, perhaps because nearly every service has gone via New Quay since December 23rd 2013. On the other hand, whereas the 2014 ‘X50’ was only a blanket north of Cardigan, the T5 has extended the blanket numbering to Pembrokeshire. As a result, there are now no less than six significantly different routes under the ‘T5’ umbrella. Of course, there are also short workings of most of these routes. In a sane world short workings wouldn’t be a problem, since the destination sign on the front of the bus would show how far the bus is going. If you want something past there you would either don’t get on or, more likely, ask the driver if there will be a connection for wherever you want to go. But this isn’t a sane world, bus operators have to abide by more-stringent regulations for working longer-distance services, so services like the T5 are registered in sections as shorter services to avoid these regulations. 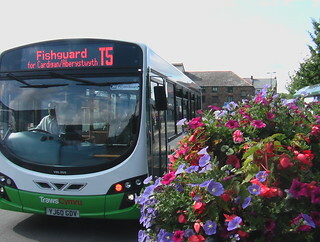 The result is a T5 departing Haverfordwest will probably say Fishguard on the front even if the bus continues to Cardigan. Cue more asking the driver if the bus goes to Cardigan. Going back to the list of six routes, some of these are only once a day, for example the one that doesn’t go via New Quay (that’s one in each direction). New Quay is even included in the route branding for the service, so perhaps there’s an even higher risk somebody will turn up for that one expecting to go to New Quay. They’d be in for a shock, and that trip (in my opinion) is the only part of the service which deserves a TrawsCymru tag. That’s yet another story though. Richards Bros, and presumably one or more of the Welsh Government, Pembrokeshire County Council and Ceredigion County Council are giving us a present this Christmas. And the nature of this present? The TrawsCymru T5 will run on Bank Holiday Monday 28th December! The timetable is not the full Monday-Saturday timetable, but given that the 28th is a Bank Holiday we’re lucky to get any service at all. There will be three services from Cardigan to Haverfordwest, one of which will either run through from Aberystwyth or provide a connection. 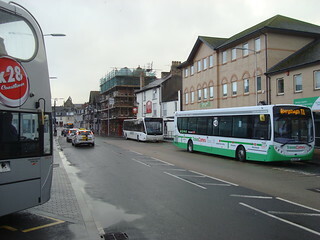 These three services then return to Cardigan, to with connections or through running for Aberystwyth. The balance is made up by a second Aberystwyth to Cardigan service, arriving at 19:27 after the last southbound service (an 18:25 to Newport, presumably returning a bus to the depot there) has left. Finally, the first journey in the morning is a 07:25 from Newport to Cardigan, balancing the aforementioned 18:25. As might be expected, the same indirect route (via New Quay, Aberporth, Newport and Fishguard) taken by the majority of T5 journeys is used. As welcome as the service is, this means that I still consider it to be a misuse of the TrawsCymru brand. There is no mention of whether Trecwn and/or Mathry Road will be served. The timetable is dated as applying to 28th Dec 2015 only, but its existence does present some hope that we may see further Bank Holiday T5 services and perhaps Sunday T5 services in 2016. Unfortunately, I’ve nothing in the spirit of Christmas cheer to post, and haven’t time to cover a full story right now. 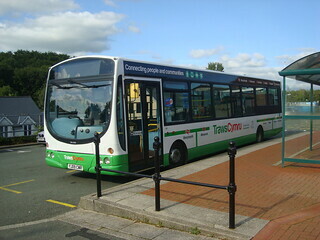 A few months ago, an ITT (Invitation To Tender) was published for a new TrawsCymru service, the T5, to replace part of the current X50 service between Cardigan and Aberystwyth as well as the 412 service between Cardigan and Haverfordwest, creating a through service between Aberystwyth and Haverfordwest. There are all sorts of reasons why this is a bad idea, which I hope to detail soon, but for now I just want to focus on one issue. The Sunday service. In the ITT, there were to be three journeys in each direction between Cardigan and Haverfordwest on Sundays, and two between Aberystwyth and Cardigan via New Quay and Aberporth. One journey southbound would be a through Aberystwyth-Haverfordwest service, and two of the northbound journeys would also have run the full distance. This would have required two vehicles, with a third working an evening trip from Aberystwyth to Synod Inn and back, via New Quay. This service would have been a rather scant one, but still alot better than nothing which is what we have at the moment. Unfortunately, the T5 timetable has now been published, and even the planned scant Sunday service has failed to materialise. Sundays will conntinue to be devoid of public transport in New Quay. Cardigan, Newport and Fishguard will also have no buses or Sundays, except for the Poppit Rocket coastal bus (which only operates on Sundays during the summer holiday season, the rest of the year it only operates Thursdays and Saturdays). Great news. You can catch a bus in Ceredigion today! So what? you might think. Today however is August 3rd 2014, a Sunday. Since December last year, Ceredigion has (I believe) been completely devoid of bus services on Sundays. 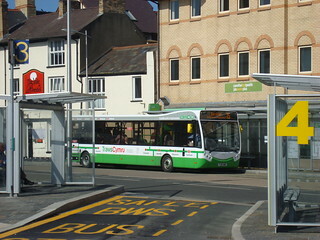 If you wanted to cross the county by public transport, your only options were the 701 coach (Aberystwyth to Cardiff) or the county’s rail link (Aberystwyth to Shrewsbury – Birmingham). 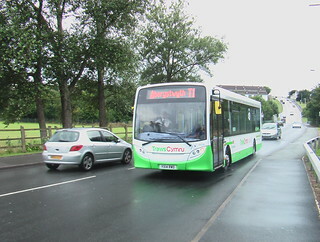 The new TrawsCymru T1 timetable, starting today, however includes Sunday journeys. So, Sunday buses have made a (very limited) come back. The Sunday timetable, just four trips each way, is rather scant compared to the hourly service that will operate the rest of the week, but it’s a start. The TrawsCymru T1 service is your direct link between Aberystwyth – Lampeter – Carmarthen offering high quality, environmentally friendly travel and value for money fares. It is the “direct link” statement that I call into question. The T1 replaces the 40/40c and, as such, follows the same indirect route. Actually, to be honest it isn’t quite the same route. The T1 is actually two routes, largely the same but with alternate trips serving some of the villages which were not served by the 40/40c. Anyway, Aberaeron and Pencader are still served, meaning it isn’t a direct route and still takes well over 2hrs end-to-end. 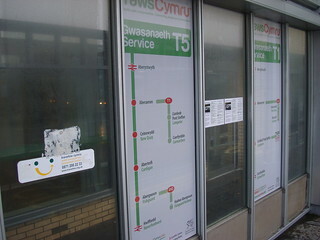 The page also claims Better connections with rail services at Carmarthen and Aberystwyth Rail Stations. I don’t know about Carmarthen, but the times at Aberystwyth are the same as the 40 service it replaces and, as I’ve said before, it isn’t really possible to make it connect with trains at Aberystwyth anyway. Invitations To Tender (ITT) have been issued for two further new TrawsCymru routes, the T2 (Aberystwyth-Bangor) and T3 (Wrexham-Barmouth) and these also include a Sunday service. Perhaps then, things are looking up for a 7-day bus network, but apart from that the TrawsCymru brand is looking a bit weak. Confusion Contribution: The new Bwcabus area map. The new Bwcabus area map creates a double whammy of confusion. Bwcabus is, of course, primarily a demand-responsive service, you have to telephone in advance in order to book your Bwcabus journey within the designated area. As the map shows there are also ordinary bus services operating within the area and others which skirt the edges. Bwcabus will connect with these fixed bus routes for passengers wishing to travel beyond the area. I like maps, but this new Bwcabus one is, in some respects, inaccurate and misleading. The first problem is that there is no distinction between the mainline bus routes which operate six days a week, with reasonable frequencies, and services that run only two days a week. The second is that the 551 service (which runs once a day during college terms only) is absent entirely. My inspiration for this post however is the third problem. The third problem is that it reinforces the confusing situation which was created by merging the X50, 550 and 50 services into one. 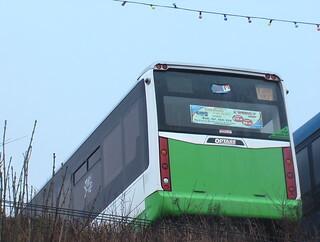 It used to be that the X50 and 550 both ran between Cardigan and Aberystwyth, via different routes (the X50 direct along the main road, the 550 via New Quay and Aberporth). 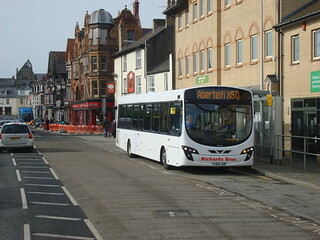 The 50, introduced by Arriva, operated from Aberystwyth to Synod Inn via New Quay. Now however all three routes are titled X50, with all but one service in each direction travelling via New Quay, around half of which also serve Aberporth. I have already seen passengers for Aberporth on the X50 realise, as we sped past the junction for Aberporth, that they were on the wrong bus. I don’t know whether they walked to Aberporth (well over a mile) or waited an hour for a bus that did actually go via Aberporth). And now this new Bwcabus map shows the X50 as a single line, with both Aberporth and New Quay shown as part of the route. Blaenannerch and Blaenporth (which are served by the X50 when it misses out Aberporth) do not appear on the map at all. There is also nothing to warn passengers for Aberporth that not all X50 services pass through Aberporth and also no indication that there is still one service which doesn’t go via New Quay. This new ‘X50’ route needs to be broken up into separate services again, X50 for the direct route between Cardigan and Aberystwyth, 50 for Cardigan-Aberystwyth via New Quay and 550 for Cardigan-Aberaeron/Aberystwyth via Aberporth and New Quay. For now, if you want a bus to Aberporth, or New Quay, check the timetable. The maps and service numbers will mislead you. Of these missing rail links (listed in bold above), the one that has attracted the most calls for re-opening is probably Carmarthen – Aberystwyth. 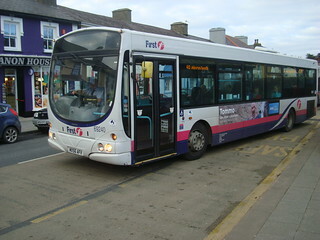 Thus, the X40 was a core route of TrawsCambria and this is evidenced by the fact it carried more passengers than any of the other TrawsCambria routes. However, the X40 is no more, having fallen victim to Arriva’s CymruExpress operation, which itself is now gone. The TrawsCymru TC1 service, intended to replace and enhance the X40, has not yet materialised, leaving a hole at the core of TrawsCambria/TrawsCymru. Instead of the X40/TC1 we have two normal services, the 40/40c. 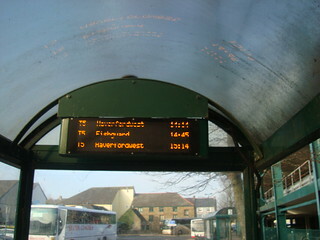 This is actually one through service, with a change of service number at Lampeter. 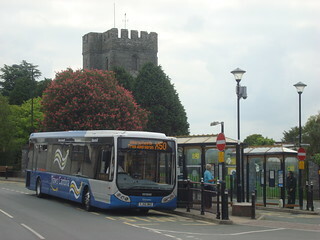 The 40/40c service largely follows the intended route of the TC1 but with standard buses rather than the high-specification TrawsCymru ones. The obvious solution is to steal back the six new buses ordered for the TC1, but the current route takes 2hrs 15mins to get between Aberystwyth and Carmarthen. That is rather slow, compared to the car, exceeding the recent recommendation (in the Winckler review) that TrawsCymru services should not be more than 50% slower. But what can be done about it? Not a lot, it seems; the 40/40c is already faster than the X40, after most of the detours were removed under Arriva’s CymruExpress. The only detour remaining is that to Pencader, but removing that would mean finding a replacement bus service for Pencader. This could easily end up doubling the overall running costs and might only have a small impact on the overall journey time. With no other detours, the only thing left to do would be change the entire shape of the service to make it more direct. That would mean missing out Aberaeron or Lampeter, possibly both. The reduced revenue that would result would almost certainly make such a proposal unworkable. Is it time for plans to be drawn up for a new express rail link between Carmarthen and Aberystwyth? That would allow the 40/40c to remain as local bus services, eg. making detours to Pencader? Meanwhile, the Welsh Government look like they are planning to upgrade the 40/40c to a TrawsCymru route in June or July, ignoring the Winckler review advice that TrawsCymru services should avoid detours. Arriva wrecked TrawsCambria and blocked TrawsCymru. Will their withdrawal mean a brighter future for Wales’ long-distance bus network? I am delighted that we can announce replacement services on the 40, 40C and 50 routes. 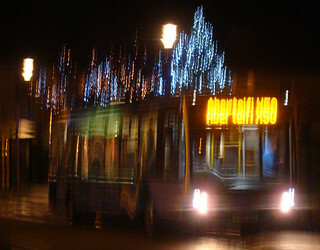 Whilst the 40/40C service between Aberystwyth and Carmarthen will be very similar to the current service, I am particularly pleased to announce that the 50 route between Aberystwyth and Cardigan will now be a greatly enhanced through-service that will avoid the need to change in Synod Inn. We have also negotiated through-ticketing between the different companies operating the 40, 40C and 50 services. And that indeed is good news, although changes at Synod Inn haven’t been necessary since Richards Bros extended the 550 from Synod Inn to Aberaeron, at the cost of making Cardigan – New Quay journeys even more impossible. However, I fear there is a devil in the details. This devil will hopefully be revealed by an explanation of the title of this article. 550 to Cardigan via New Quay and Aberporth, hourly as far as Synod Inn extending every two hours to Cardigan. Operated by Arriva Aberystwyth except a few journeys (principally the last two evening services) worked by Richards Bros. 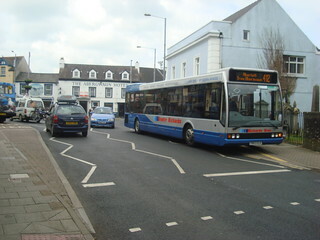 The full trip would take about half an hour longer than the X50 thanks to the diversions round New Quay and Aberporth. I’ve always been of the opinion that it was a mistake to include the 550, at least the section south of New Quay, in the TrawsCambria network. 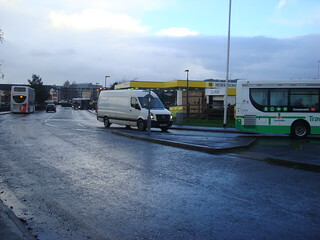 It was an important local service, but for TrawsCambria the indirect route to Cardigan has to make the service unattractive for long-distance journeys. I spoke to Proffessor Stuart Cole at the TrawsCambria network consultation, objecting to the idea of the network being renamed TrawsCymru. His reply was that the TrawsCambria brand had some baggage. I can only assume he was referring to the 550 and the lack of toilet facilities for the long-distance Aberystwyth – Swansea/Cardiff runs. As far as long-distance travel is concerned, I believe the X50 should have run through to Aberystwyth more frequently, roughly every two hours throughout the day, and the 550 should have been just another local service. Now though, it seems it is Aberporth All Over Again, with the direct X50 service being cut to one service each way (southbound in the morning, returning in the afternoon). This allows Arriva’s aborted 50 service to be replaced by an hourly service between Aberystwyth and Cardigan via New Quay (and Aberporth on alternate journeys). Weirdly, in a move that will probably confuse some who won’t know which services go via Aberporth and which is the one that still avoids New Quay, all services will now be given the X50 number. I hope this is left as a local service and doesn’t become TrawsCymru, because that would be adding the baggage of slow, indirect, journeys to the brand again. Another threat to the TrawsCymru brand is the proposed extension south from Cardigan to Haverfordwest. Again this great news on the face of it, since connections to/from Haverfordwest in Cardigan have always been largely non-existent. However, another Aberporth-like-devil lurks in the details of this proposal. 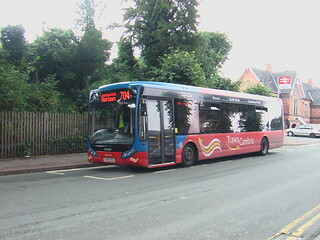 The current service between Cardigan and Haverfordwest, the 412, takes a rather indirect route itself, going via Fishguard, Trecwn (on some trips) and Mathry Road. Yet it doesn’t serve either of Fishguard’s rail stations (actually in Goodwick, not far from Fishguard). A much better prospect for TrawsCymru, in my view, would be to bring back the direct X50 service and extend it to Fishguard Harbour station for rail connections. To end on a positive though, as a local service things are much improved today compared to last week with Arriva’s services operating, since you can now go from Cardigan to New Quay by public transport, and you don’t even have to change bus.